Complementary or discrepant stages of change for multiple risk behaviors can guide the development of effective risk reduction interventions for multiple risk factors. The objectives of this study were to assess readiness to change physical activity and dietary practices and the relationships among readiness scores for physical activity and dietary practices. In an underserved population, the readiness scores were analyzed in relationship to the patient's interest in communicating with healthcare providers about health behavior change. Healthcare providers are important contributors in promoting behavior change in community health centers. Patients completed questionnaires about communicating with healthcare providers and readiness to change physical activity, intake of fruits and vegetables, dietary fat, calories and weight management. Frequency distributions, correlations, and analysis of variance were computed. Readiness to change physical activity was not related to readiness to change dietary practices. Readiness to change fruit and vegetable intake and readiness to change dietary fat intake were significantly related. Readiness to change and interest in communicating with healthcare providers were significantly related for physical activity but not for dietary practices. Readiness to change behavior and interest in talking to healthcare providers were distinct dimensions; for physical activity, the dimensions were congruent and for dietary practices, the dimensions were unrelated. Readiness to change physical activity and dietary practices were not related (discrepant stages of readiness). Therefore, among underserved populations, sequential rather than simultaneous interventions may be appropriate when intervening on multiple risk behaviors, particularly physical activity and dietary practices. The prevalence of obesity has reached epidemic proportions among adults and youth [1, 2]. Obesity, physical inactivity, and unhealthy eating habits are major risk factors for chronic disease, disability, and premature death [3–5]. The combination of eating a balanced, reduced calorie, diet and regular physical activity has a stronger effect on long-term weight loss than either strategy alone [6–8]; therefore, both strategies are needed. A better understanding of the relationships among multiple behavioral risk factors is important for the design of individual, clinical, and public health interventions, particularly cost-effective interventions to target high-risk individuals and population subgroups . From a behavioral sciences perspective, the stages of change from the Transtheoretical Model suggest that individuals can be at different stages of readiness to change for different behavioral risk factors. Each behavioral risk factor has its own set of knowledge, attitudes, intentions, decisional balance, and self-efficacy . Motivational readiness described in the stages of change model  has been used to tailor interventions to an individual's level of motivational readiness to change behavior. Interventions tailored to match level of motivational readiness outperform standard interventions . Previous research on predominately well-educated, non-Hispanic whites, has examined the relationships among motivational readiness for smoking, physical activity, and dietary practices. The findings include the following: readiness to adopt vigorous physical activity was positively associated with readiness to avoid dietary fat ; smokers were less likely than non-smokers to be ready to avoid dietary fat and engage in vigorous physical activity ; smoking was negatively associated with readiness to engage in vigorous physical activity ; intention to reduce dietary fat was greatest among those who already reported avoiding high fat foods, and the average number of fruits and vegetables consumed differed significantly by stages of readiness to avoid dietary fat ; motivational readiness stages were positively related for physical activity and dietary changes ; and readiness to change physical activity was moderately correlated with readiness to change fat and vegetable intake . Similarly, readiness to change physical activity was moderately correlated with readiness to change both fat intake and fruit and vegetable intake . Readiness to change fat intake was strongly correlated with readiness to change vegetable intake . From the limited empirical literature (only two relevant studies that did not focus on smoking), the motivational readiness stages for physical activity and dietary change were complementary. Given the epidemic rates of obesity [1, 2] and the paucity of data about the relationships between physical activity and dietary practice, more research is needed to confirm whether the motivational readiness stages for physical activity and dietary practice are, in general, complementary or discrepant. If interventions are presented simultaneously for two or more behaviors, complementary stages of readiness may facilitate behavior change, whereas discrepant stages of readiness may overwhelm or hinder successful change for multiple behaviors. This distinction may be particularly critical for the development of effective interventions among underserved populations in which few stages of change (tailored), programs combine physical activity and dietary practice changes. To effectively promote behavioral risk factor reduction, patients with adverse risk profiles should receive physician guidance or be willing to communicate with a healthcare professional [16, 17]. An unwillingness to communicate can be a barrier to successful behavior change. One study  reported that willingness to communicate was directly related to a greater readiness to change behavior. In contrast, another study  found that willingness to engage in a two-way communication with the healthcare provider to reduce behavioral risk factors was not associated with readiness to change behavioral risk factors (e.g., smoking, diet, physical activity). Readiness to change behavior and interest in communicating with physicians may be distinct and unrelated dimensions. Specifically, this study was designed to contribute to our empirical knowledge in the following ways: (a) the focus was on physical activity and dietary practices (behaviors most related to obesity) rather than smoking; (b) a measure of motivational readiness for calorie intake and weight management was included (this assessment was not included and analyzed in previous studies); (c) our sample was composed of uninsured and underinsured ethnic minority patients; and (d) the relationships were analyzed among readiness scores and interest in talking to the healthcare provider (in previous studies, this relationship was not assessed). 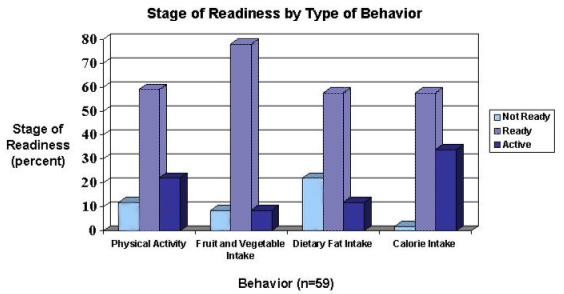 What are the levels of readiness to change behavior for physical activity, fruit and vegetable intake, dietary fat intake, and calorie intake? What are the relationships among readiness to change behaviors for physical activity, fruit and vegetable intake, dietary fat intake, and calorie intake? What are the levels of interest in communicating with the healthcare provider about physical activity and nutrition? What is the relationship between levels of interest in communicating with the healthcare provider about physical activity and nutrition? Is there a significant relationship between the readiness score for physical activity and the patients' interest in communicating with the healthcare provider about physical activity? Are there significant relationships among readiness scores for the three nutrition behaviors and the patients' interest in communicating with the healthcare provider about nutrition? A convenience sample was recruited from clients at three Community Health Centers belonging to the Clinical Directors Network, Inc. (CDN) . CDN is composed of over 230 member practices serving ethnic minority and low-income clients in 17 states and three U.S. territories . The selection criteria for the three Community Health Centers included willingness to participate and medical directors who had expressed interest in the study. The target population was adult patients, aged 18 years old or older, who were being seen in the Community Health Center on the day that the interviews were being conducted. Research assistants (three women and one man) approached patients in the waiting area, who appeared to be in the targeted age range, introduced the project, and then proceeded to obtain verbal consent. An information sheet that provided information on the purpose of the study, the study procedures, risks and benefits of participating, and the rights of participants was provided prior to administering the survey. Since the surveys were conducted anonymously and no identifying information was captured, verbal informed consent was obtained. No written informed consent was required. Patient identifying data were not collected as part of this project. To be eligible, patients had to be 18 years of age or older, able to read and write English, and identify the Community Health Center as their source of primary care. Patients who appeared acutely distressed or were holding a child were not approached. The project was reviewed and approved by the Clinical Directors Network Institutional Review Board. When the research assistant approached the patient (in the target age range and not acutely distressed), sitting in the waiting area for a general physical examination, s/he explained that CDN, in collaboration with the University of Texas, was conducting a pilot study about the counseling habits of primary care clinicians in Community Health Centers in New York City and New Jersey. Also, the research assistant explained that the project was aimed at examining the effects of health habit discussion on physical activity, eating habits, and other health related habits. Patients who gave verbal consent to participate in the study received the written questionnaires to complete while waiting for appointments with their physicians. Eighty seven patients were approached. Of these, fifty nine patients (68%) completed the entire survey. Six patients (7%) consented to be in the study and partially completed the survey. Four patients consented to be in the study and did not complete the survey. Eighteen patients (21%) declined to participate in the study. Patients who consented to be in the study but did not complete the survey were called to see the doctor and did not return to complete the survey after the medical visit. Patients who declined to participate gave the following reasons: survey too long, survey too wordy, busy with medical visit, did not want to participate, and blurred vision because of eye medication. Patients who agreed to take part in the study were given a paper and pencil questionnaire while they were in the waiting room. The questionnaire included the Patient-based Assessment and Counseling for Physical Activity and Nutrition (PACE) assessment form [21–23] and author-constructed questions on willingness to discuss physical activity and nutrition with the healthcare provider. All questionnaires were in English. The format of the author-constructed questions was a Likert scale with the following statements: "I am interested in talking to my healthcare provider about physical activity" and "I am interested in talking to my healthcare provider about nutrition." The response categories were: 1) strongly disagree, 2) disagree, 3) undecided, 4) agree, and 5) strongly agree. The scores on these questions determined the patient's interest in communicating with the healthcare provider. Also, the questionnaire included demographic questions about gender, racial/ethnic background, country of birth, and occupation. The PACE assessment form was developed to identify the stages of change [21–23] for physical activity behavior in order to assist physicians with counseling. Recently, the PACE program has been expanded to include three nutrition behaviors related to health outcomes . PACE has eight graded statements related to current physical activity status and four graded statements related to fruit and vegetable intake, dietary fat intake, and calorie intake. The score on the PACE assessment form was used to categorize the patient into one of three groups, based on a simplified stages of change model: "not ready" (precontemplation-not physically active and not intending to become physically active or not intending to start eating more fruits and vegetables in the next six months), "ready" (contemplation-little or no physical activity, but intending to become physically active or has been thinking about eating more fruits and vegetables in the next six months), and "active" (physically active on a regular basis or consistently eats five or more servings per day of fruits and vegetables). The PACE assessment form has test-retest reliability of 0.80 and evidence for construct validity [22, 23]. For research question one, regarding the levels of readiness to change behavior, frequency distributions and percentages were calculated. For research question two, the relationships among the readiness scores were addressed using chi-square analysis. For research question three, patients' levels of interest in communicating with the healthcare provider about physical activity and nutrition were addressed by 95% confidence intervals. For research question four, Pearson product-moment correlations were computed. For research questions five and six, one-way analysis of variance (ANOVA) was performed. The independent variables were the stages of change with three levels (not ready, ready, and active) and the dependent variable was interest in communicating with the healthcare provider. For question six, three separate ANOVAs were conducted to assess differences in interest in discussing nutrition among the stages of change groups based on the nutrition categories of fruits and vegetable intake, dietary fat intake, and calorie intake and weight management. For significant F's, Tukey's post hoc tests were used to assess which stages of change were significantly different. A total of 59 patients participated in the study. The mean age (±SD) was 39.6 (±15.6) years. Approximately 68% of the patients were women. The sample was 87% African American/Black, 9% Hispanic, and 4% other racial/ethnic group. Clinical Director Network patients are either uninsured or have some form of public health insurance (Medicaid, Social Security/Disability). In each category of change, the majority of participants indicated that they were ready to adopt a healthier behavior (Figure 1). Percentages ranged from a low of 57.63% for calorie intake to a high of 77.97% for fruit and vegetable intake in the ready to change stage. In each category, there were more participants in the active stage (8.47%–33.90%) than in the not ready stage (1.69%–22.03%) except for dietary fat intake. Figure 1 is a graphic summary of these findings. The readiness for changing physical activity was not related to any of the three nutrition variables. Among the nutrition variables, readiness for changing fruit and vegetable intake was significantly related to the readiness for changing dietary fat intake (X 2 = 12.89, N = 52, p = .01). Thirty-three of the 52 respondents (63.5%) were in the same readiness level for both of these variables. The relationship between readiness for changing fruit and vegetable intake and readiness for changing caloric intake approached significance (X 2 = 9.19, N = 53, p = .06). Thirty-five of the 53 respondents (66.0%) were in the same readiness level for both of these variables. The 95% confidence interval for interest in discussing physical activity, based on a mean ± SD of 3.74 ± 1.39 (N = 53), was 3.36–4.11. The 95% confidence interval for interest in discussing nutrition, based on a mean ± SD of 3.77 ± 1.41 (N = 53), was 3.39–4.15. Neither of these confidence intervals includes the midpoint of the scale, 3 ("Undecided"), and both of these confidence intervals include the point 4 ("Agree"). Hence, the patients' interest was significantly greater than "undecided" but not significantly different than "agree" which indicated they were interested in discussing these topics with their healthcare providers. There was a statistically significant correlation between interest in discussing physical activity and interest in discussing nutrition (r = .89, p < .01). The more interested individuals were in discussing physical activity, the more interested they were in discussing nutrition. Significant differences in interest to discuss physical activity were found among the stages of change groups for physical activity (F[2,48] = 6.33, p < .01). Tukey's post hoc test revealed that both the "Active" (M = 4.17) and the "Ready" (M = 3.88) groups showed significantly more interest in discussing physical activity (p = .05) than the "Not Ready" group (M = 2.14). The "Active" and "Ready" groups were not significantly different from each other. No significant differences in interest to discuss nutrition were found for the fruits and vegetable intake stages (F[2,48] = .47, p = .63), the dietary fat intake stages (F[2,47] = .27, p = .77), or the calorie intake and weight management stages (F[2,49] = 2.00, p = .15). Therefore, stages of change and interest in communicating with the healthcare provider were not related among the nutrition behaviors. Among the ethnic minority patients seen in the New York City area Community Health Centers, most participants reported that they were ready to change their physical activity and nutrition behaviors, and were interested in discussing physical activity and nutrition with their healthcare providers. Interest in discussing physical activity was significantly related to interest in discussing nutrition with their healthcare provider. The readiness scores for physical activity and nutrition were not significantly related and among the nutrition readiness scores only the relationship between fruits and vegetables and dietary fat intake was significant. The relationship between readiness and interest in discussing health behaviors with their healthcare provider was different for physical activity and nutrition. For physical activity, the active and ready groups were more willing to discuss physical activity with their healthcare provider than the not ready group. For nutrition, however, there was no relationship among readiness scores and interest in discussing nutrition with their healthcare provider. This discrepancy between nutrition readiness scores and interest in discussing nutrition raises concerns about the likelihood for behavior change and decreasing health risks. Two previous studies found that readiness to change physical activity was moderately correlated with readiness to change dietary practices. Readiness to change fat intake was strongly correlated with readiness to change vegetable intake . Also, readiness to avoid high-fat foods was strongly associated with intention to reduce dietary fat; intention to reduce dietary fat was associated with avoiding high fat foods; avoiding high fat foods was associated with consuming more fruits and vegetables . In our study, similar to previous research, readiness to change fat intake and readiness to change fruit and vegetable intake were related. Our findings that physical activity and nutrition readiness scores were not related differed from findings of previous research [14, 15]. One possible explanation for this difference is the distribution among the stages of change. In our study, 57% to 78% of the patients were in the ready category for behavior changes, and only 8% to 34% were in the action and maintenance categories (Figure 1). Conversely, in one previous study , only 8.0% to 24% of the participants were in the ready category, and 60% to 85% were in action and maintenance categories. In another study , 51% of participants were in maintenance and action to regularly avoid high fat foods, 33% were in the readiness stage, and 15% were in precomtemplation. The differences in the distribution of the readiness scores between our study and earlier research may be because of different study populations and differential rates of health risks such as obesity and diabetes . Given the high levels of cardiovascular risk factors in the target population, including hypertension (32%–40%), diabetes (16%), overweight/obese (58%), hyperlipidemia (66%) and smoking (30%) , interventions to improve dietary practices and physical activity are critical to reduce health disparities, a major initiative for medicine and public health . The findings from our study suggest that for underserved populations, sequential risk reduction interventions may be more appropriate than simultaneous interventions because the physical activity and nutrition readiness to change scores were discrepant stages of change. Future research is needed, however, to address the relationships among readiness scores for different health behaviors. In a randomized controlled trial with diverse populations, the effectiveness of sequential and simultaneous multiple risk factor interventions can be compared. Such studies can help us understand better the importance of relationships among dimensions of readiness for multiple behavioral risk factor interventions. The implications of these studies relate to whether simultaneous or sequential risk reduction interventions are more effective in populations with several behavioral risk factors. Furthermore, a critical issue is how healthcare providers can reach and motivate patients who need to change behaviors, however, are unwilling to communicate. In a previous study , no association was found between readiness to change behavioral risk factors and willingness to engage in two-way communication. Similarly, we found no significant associations among nutrition behaviors; in contrast, we found that for physical activity, the active and ready groups were significantly more interested in communicating with their healthcare provider about physical activity than were the not ready group. Among several behavioral risk factors, readiness and interest in communicating with their healthcare provider may have different relationships. Moreover, our study complements and adds a new dimension to an earlier study  that reported willingness to communicate was directly related to readiness to change adverse health-related behavior. In this earlier study, willingness to communicate and readiness to change individual lifestyle were global measures. In our study, these constructs were specific measures about the health care provider, physical activity, and nutrition. Future research can help us understand better the relationships among dimensions of readiness and receptivity to communicating with the healthcare provider. There are several limitations that may affect the generalizability of the current study's results. It was a pilot study: the design was cross-sectional, the sample size was relatively small, and patients were not randomly selected. Because of the sample size, we did not control for socio-demographic variables such as age, gender, education, and the presence of chronic conditions. The variable "interest in communicating" was based on one question instead of a multi-item scale with known psychometric properties. Also, because the study was conducted in English, selection bias may have resulted in an under-representation of Hispanics. This study has several strengths. A high percentage – almost 70% – of the patients approached completed the questionnaires. Our patients were from an underserved population. Additionally, the psychometric properties of the PACE assessment form have been well documented [21–23]. The validity of PACE protocol has been established among racially and ethnically diverse populations and various socioeconomic backgrounds [23, 27]. Furthermore, the participants answered questions in the waiting room prior to an appointment with the healthcare provider. This setting and situation most likely enhances the salience and meaning of questions about the patient's interest in talking to the healthcare provider. We found that most participants reported that they were ready to change their physical activity and nutrition behaviors and were interested in discussing physical activity and nutrition with their healthcare providers. Interest in discussing physical activity was significantly related to interest in discussing nutrition. The readiness scores for physical activity and nutrition were not significantly related. However, relationship between fruits and vegetables and dietary fat intake was significant within the nutrition readiness score. The relationship between readiness and interest in discussing health behaviors with their healthcare provider was different for physical activity and nutrition. Our findings raise important questions about the relationships among readiness scores for different behaviors, as well as the relationships among readiness and interest in communicating with the healthcare provider. A recent scientific statement from the American Heart Association asserted that physical activity as a treatment is under-recommended by physicians and that healthcare professionals should prescribe physical activity to prevent and treat cardiovascular disease . Prescribing regular physical activity as an intervention treatment for those with cardiovascular disease risk factors can often be as useful as some of the more expensive medical treatments . It is particularly encouraging that in our study, most patients were in the ready stage for both dietary practice and physical activity change and willingness to communicate with their healthcare provider regarding these lifestyle changes. Individuals in the ready stage are the most amenable to public health interventions. To achieve the objectives of improving chronic disease outcomes and reducing excess morbidity and mortality, the context of physician-patient communication and the interactions among readiness to change multiple risk behaviors merit further research in primary care settings and underserved populations. This research was supported by a grant (#042938) from The Robert Wood Johnson Foundation. The authors gratefully acknowledge the editorial assistance of Karen L. Pepkin, M.A. Also, the authors wish to thank Drs. Karen J. Calfas and James F. Sallis for providing the PACE assessment forms and their guidance on administering the forms. WCT conceived of the study, guided the design of the study, drafted the manuscript, and was the principal investigator. JTH participated in the design of the study, performed the statistical analyses, drafted the results section, and provided input on the entire manuscript. EL was an investigator on the study and participated in the design, contributed to the literature review, and wrote portions of the manuscript. AC was responsible for the overall data collection and management of the study. YL participated in the coordination of the study and administered the surveys at the participating sites. MS facilitated the implementation of the study at her site. AV facilitated the implementation of the study at her site. JNT provided oversight for the development and implementation of the study at the CDN-member affiliated Community Health Centers and was the co-principal investigator. All authors read and approved the final manuscript.